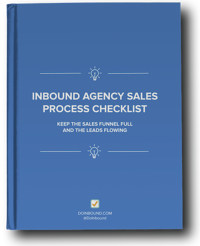 In this episode of Inbound Sales Journey, Ryan and Gray break down their favorite ways to generate leads for your agency. The first step in generating leads for your agency, no matter the situation, is to define your niche and services. Everything is guided by these principles. Don't be full service and everything to everyone. Pick a target and decide how you can serve them. This will make you stand out from other agencies all marketing themselves the same way. Once you find a niche that is there, you need to find a way to be where your ideal market is. Some examples of this would be slack groups or Facebook groups, industry pages like inbound.org, etc. Have a way to give value to these ideal prospects. A premium resource or a high-value free tool related that will help them solve a problem. Get involved and add value and you'll find people reaching out to you that already trust you. We know a lot of our listeners are inbound agency owners, but there IS value in paid advertising! Give these a chance to see what you can do. With great targeting and focus on the niche and a smart offer. They provide extreme targeting options and opportunity to get in front of the ideal prospect. It's also easier to track ROI on your funnels and marketing channels. The downside is finding someone who's good at this to set it up and run it. Done correctly it's powerful, done poorly; it's a huge loss of money! We've built several tools like the Inbound Revenue Calculator that we used with our clients. By turning around and giving these for free to clients or agencies when we started DoInbound helped us attract high-quality clients. To build tools, pay attention to your pain and what you're creating internally to solve it or what pains your customers have. Releasing it to the public will bring you valuable business! Agency Partnerships helped us grow GuavaBox. They allow you the chance to partner with complementing skills to help clients. They also allow you to send leads and be paid and vice versa. This way, agencies are helping each other grow and sending ideal clients to one another. For more information about partnerships, listen to this episode.